Fuchsia Flowered Gooseberry is a common, colorful and interesting-looking plant, with bright red tubular flowers, deep dark shiny green leaves, and spiny stems. 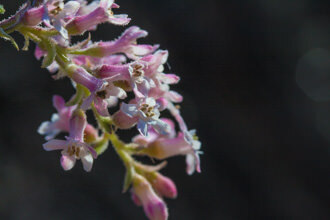 The flowers can be found in bloom from January through May. The bright red flowers line the stems of the plant, sometimes displaying their color for up to several feet long. They individually are up to an inch long and bristly, with one to four flowers occurring together on a common stem. The protrusions you see from the bottom of the downwardly-drooping tubular flower are the stamens. The seed is even more bristly than the flower, and sticky to boot. The roundish three-lobed shiny green leaves are up to an inch and a half diameter and accompanied by spines on the stem. A word about those spines: they are as sharp as they look! Migrating hummingbirds are attracted to the tubular flowers on this plant. The genus name Ribes is derived from an old Persian word. The species name speciosum means "showy". Last modified: April 13 2018 07:35:56.